[SatNews] ...the satellite will provide data transmission services for the French and Italian defense ministries, as well as these countries' security organizations. The "green light" has been given for this week's heavy-lift Ariane 5 mission from the Spaceport, which is to orbit a dual-passenger payload consisting of two advanced relay platforms: ABS-2 and Athena-Fidus. Ariane 5’s final payload integration – which occurred inside the launch vehicle’s Final Assembly Building – is highlighted in the sequence above. 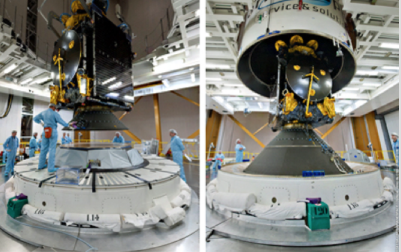 Athena-Fidus is being installed atop the launcher’s core cryogenic stage in the left-hand photo; while at right, the payload fairing containing ABS-2 is lowered over its co-passenger to create the dual-payload “stack.” Photos are courtesy of Arianespace. "go" status of the launcher, its payload, the Spaceport's infrastructure and the system of downrange tracking stations. With today's review, the Ariane 5 is now cleared for rollout tomorrow from the Spaceport's Final Assembly Building to the ELA-3 launch zone - where it will be readied for liftoff on February 6 during a 2-hr., 5-min. launch window opening at 5:30 p.m. local time in French Guiana. The payload lift performance for Arianespace's latest Ariane 5 flight is approximately 10,210 kg., which includes a combined total of some 9,410 kg. for ABS-2 and Athena-Fidus, along with the launcher's SYLDA dual-passenger dispenser system and satellite integration hardware. Produced by SSL (Space Systems/Loral) for global satellite operator ABS, the ABS-2 c, as well as the supply of substantial new capacity from the operator's prime orbital location at 75 deg. East. Thales Alenia Space built Athena-Fidus on behalf of the French CNES and Italian ASI space agencies, as well as the French DGA and Italian Segredifesa defense ministry organizations. After its deployment by Ariane 5, the satellite will provide data transmission services for the French and Italian defense ministries, as well as these countries' security organizations.